You'll be £19.99 closer to your next £10.00 credit when you purchase On Spartan Wings. What's this? Rarely has an air force gone into combat as poorly prepared and outgunned as the Royal Hellenic Air Force had to when Mussolini’s Italy dragged Greece into war on 28 October 1940. Without warning, as Italian forces poured over the frontier from Albania, the RHAF’s paltry effective lineup of 128 battleworthy aircraft, most of them obsolete, were pitted against the 463 fielded by the Regia Aeronautica, whose pilots had honed their skills in the Spanish Civil War. On the Greek side, though, aces such as Marinos Mitralexis, with his audacious ramming of an Italian bomber on the fifth day of the war ensured that morale in the RHAF remained high. Though the RAF pitched in with whatever help it could provide in machines and manpower, the aerial war was unequal from the first. By the end of 1940 the RHAF was seriously depleted, though individual pilots and crews continued to fight valiantly. The end came in April 1941 when Hitler sped to the rescue of the Duce. The Luftwaffe blasted out of the sky what remained of the RHAF and whatever RAF units remained to help out its last stand. A single mira (squadron), with just 5 Avro Ansons escaped intact to Egypt, where British forces were bracing for Rommel’s onslaught. Out of this small squadron grew three full mirai, whose pilots, now equipped with modern aircraft, played a decisive part in the Allied victory at El Alamein. Until Greece was liberated in October 1944 the RHAF units in the Allied air forces ranged over targets in the Aegean Sea, Italy and Yugoslavia. The RHAF was little affected by a communist-inspired mutiny in the Greek forces in Egypt that briefly threatened to neutralize the Greek contribution. After the end of World War II the RHAF was called upon to confront the threat of an attempted communist takeover of Greece and played a major part in overcoming the rebellion and saving the country for the West. Meticulous research interwoven with first-hand accounts makes this a fitting tribute to the skill and heroism of the Greek airmen and a valuable account of a neglected aspect of WWII air warfare. In the hands of John Carr, this history of the RHAF and its men emerges as an engaging testament of courage and perseverance - and occasionally humour - in the face of adversity. On Spartan Wings is a worthy effort on an interesting if somewhat marginal topic. John Carr tells a complex and little-known story with great brilliance. The writing is fluid yet precise, with a wealth of telling detail expertly marshalled into the overall narrative. Like the seasoned journalist he is, he vividly recreates scenes of combat and adventure, both in the sky and on the ground. This is not just good military and aviation history, it is a compelling human story and a significant contribution to our understanding of Greece in the Second World War. The Greeks suffered during the Italian and German invasion with a very poorly equipped air force and with support from the RAF which was also poorly equipped because first priority went to British home defence and then to Egypt, leaving little that could be sent to Greece. 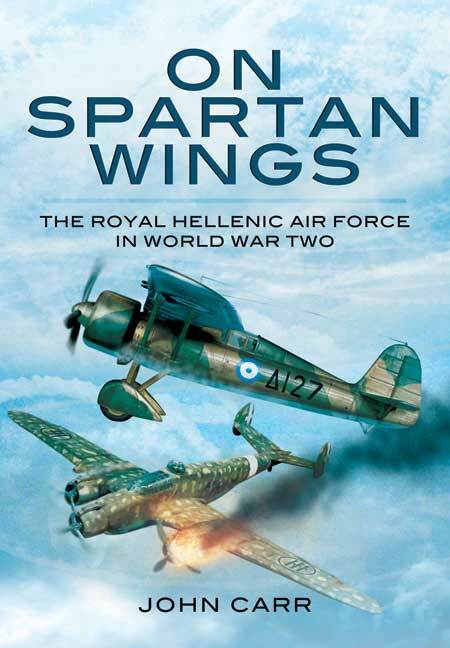 The author tells the story of the Greek defeat and the development of a new Greek air force in Egypt that grew to three full squadrons equipped with modern British aircraft and returned to Greece after liberation to confront the communist rebels that were attempting to take over Greece. This is a valuable account of Greek fortunes during WWII but it also adds to the under told story of the Greek civil war that followed liberation where the RHAF proved a stabilizing force against the communists. This is the story of the Royal Hellenic Air Force in World War Two and if, like me, you knew nothing or little about it, it will be a real eye-opener. It is because information is so scarce that it makes it all the more valuable that somebody has produced a book telling of this little-known - in Britain, at least - epic of aviation heroism. All too often when studying the Second World War everything focuses on Britain, Germany, America, France and Russia; forgetting that there were many other countries involved and that each have their own stories to tell. This book goes part of the way to changing that pattern. Carr looks at the role of the Royal Hellenic Air Force. It is a detailed study of an air force and air battles which are often overlooked or little known. He highlights the problems caused by the lack of an air defence warning system causing civilian aircraft to be mistaken for enemy planes. Information is also provided about the role of the British contingent sent over to help the Greeks which gave the RHAF breathing space and undoubtedly kept the RHAF flying and fighting long after it could have done so unaided. With the fall of Greece, many pilots refused to submit to the Germans and flew to Egypt to join with the Allied forces, resulting in the creation of the 335 Mira squadron with operational links with the RAF. Particulalry interesting are the tales of training in Rhodesia - again a little known subject, and one offering lots of challenges for the instructors and trainees. Typical of these were how to cope if you have to land in the jungle, and the problems of teaching trainees with little knowledge of English. An extremely interesting and informative book. It has been well researched and fills a definite gap in the market.